This is my first News Roundup. It will be longer than Malvaney’s News Roundups normally are as I have gathered news from the last several weeks from these papers. Many of these stories are from small town Mississippi newspapers, printing entities that are sans websites. The Friday, February 26 edition of The Bolivar Commercial reported that the Cleveland School District Board of Trustees has closed the old section of the H. M. Nailor Elementary School. While the article does not mention demolition, it appears that the Board of Trustees intends to demolish the old section, including the gymnasium which served as a venue for the Harlem Globetrotters, Ike and Tina Turner, Mahalia Jackson, and others. H.M. Nailor is a historic African American school, which the community has a deep attachment to due to its importance. Unfortunately, this historic structure has suffered from years (probably decades) of deferred maintenance and is now embroiled in a school consolidation debate. More information can be found about the school here, here, and here (scroll down to the date 3/02/2010). 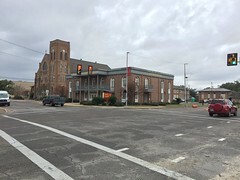 According to the Deer Creek Pilot’s January 14 edition, the Issaquena County Courthouse in Mayersville could be receiving some much needed renovation and expansion. I hate to say this but no matter what they do, it will still be a metal building and probably the least impressive courthouse in the state. The Itawamba County Times ran two articles in February (February 10 and February 24) about the former Fulton Grammar School. The school was abandoned and scheduled to be demolished in 1999 after the Itawamba Attendance Center was constructed. These articles commemorate the first open house event at the school after a six-year restoration program. WTVA in Tupelo also reported the story on February 21. The Itawamba Connections blog has some pictures of the restoration. This is the good part of preservation, the success stories. Of course, MDAH should claim partial credit for this success, awarding a Community Heritage Preservation Grant (CHPG) to the school in 2001, the same year it became a Mississippi Landmark. The Wednesday, February 3 edition of The Newton County Appeal ran an article detailing the restoration efforts the Newton Historical Cultural Commission has undertaken on the McElroy-Hoye House. Constructed in 1861 and acquired from the First Baptist Church in 2002, the structure was moved to a new site across Church Street in Newton last year. The first phase of restoration of the McElroy-Hoye House is nearly finished. During the 1940s and 50s, the ceilings were lowered, wallpaper and paneling were installed, and partitions were inserted to convert the single-family structure into apartments. Still much of the original historic fabric of the house remains as previous owners did not replace the original wood siding, original windows and doors, and chimneys. The next phase of renovation includes constructing a new front porch, acquiring new double doors for the entry, and repainting the exterior. 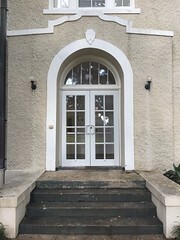 Restoration of the McElroy-Hoye House has been aided by a 2007 CHPG from the MDAH, while grants from the Mississippi Arts Commission, MDAH, and the National Endowment for the Arts, as well as funds from the United States Department of Agriculture enabled the building’s relocation. 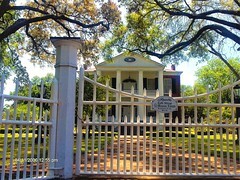 The house was designated a Mississippi Landmark in 2006. While The Newton County Appeal article is not online, more information on the house can be found on the Newton County Historical Genealogical Society website and at WTOK. The Thursday, February 4 Northside Sun in Jackson (technically Northeast Jackson, Madison, and Ridgeland) reported that Mississippi House Bills 1366 and 637, authored by District 66 Representative Cecil Brown, would allow the Mississippi Development Authority (MDA) and the Department of Finance and Administration (DFA) to sell the old Mississippi School for the Blind campus to developers. Duckworth Realty, Barranco Architecture, and Breck Hines plan to turn the campus into the District at Eastover, a $150 million, 640,000-square-foot development. For some great pictures of the school, check out a previous MissPres post on the school. Here is another link from The Northside Sun dating to two years ago; compare the numbers quoted in each development. Members of the Oxford Historic Preservation Commission and church representatives discussed the church’s request before determining that more information is needed before a decision can be made. Those at the meeting agreed Tuesday’s consideration of the request would be considered a preliminary review. Ron Garner, the architect representing the church, asked for permission to demolish houses at 410 and 416 S. 5th St. The two buildings have outlived their usefulness, Garner said. Unfortunately, many people in the neighborhood share the view of Ron Garner and other church officials. Despite the commission’s reluctance to vote on the issue without getting some additional information about the proposed parking, neighbors in the area voiced their support for the demolition of the buildings. “I am all for preserving the historic look of a neighborhood,” said Lowry Lomax of 404 Tyler Ave., whose property backs up to the site in question. Other neighbors also showed support for allowing the church to knock down the two buildings and build a new one. Lomax noted the current buildings are an eyesore. “The commission has a general uneasiness with approving tearing down anything,” Frye said. “For us to consider that seriously, we would like to be provided with more information than what we have here on paper. Church representative Paul Behrndt noted that the current buildings are no longer useful as classrooms and the structures have safety concerns. Also, the new education building can’t be built if the church has to continue maintaining the other two deteriorating properties. A new education building would complement the new church, according to church representatives. The planned two-story building would provide space for administration offices, classrooms[,] and a multipurpose room. As to Mr. Lomax, if these houses are a ghetto; one, then I have been living in slums for years and two, you have obviously never heard of Detroit, Houston, Birmingham, or any number of other places that makes 5th Street in Oxford look like a gated, upper-crust neighborhood. I do like Kevin Frye’s quote, basically stating that Oxford is full of ugly houses. Google Maps Street View should give Mississippi Preservationists an idea of what these houses really look like. The Oxford Historic Preservation Commission meets Tuesday, March 9. An update on this story might be available after that meeting. Unfortunately, if St. John’s in Oxford is anything like St. Joseph’s in Starkville, those houses will have their next stop in a landfill. However, that is another post for another time. The Oxford Historic Preservation Commission will also hold a review on whether to allow the demolition of a house at the corner of South 16th St. and Garfield Ave. for the construction of three houses. The Vicksburg Post can always be counted on for interesting historic and preservation-related news. Unfortunately, they ran a disheartening editorial about Ceres Plantation in Sunday, February 21st‘s paper. Since the editorial was published under the “Our Opinion” section, that means that the editors at the Post are gung-ho about speculative, mercurial future developments. On that topic, I have a bridge I wish to sell them. Seriously, it’s in Brooklyn; they will love it. I will need cash upfront though. February 23rd’s front page is covered with a large, historic photograph of the old Kuhn Memorial State Hospital. The website article has a far more depressing photo of Kuhn in its current state. Opened in 1959, Kuhn is a good example of mid-century institutional architecture. 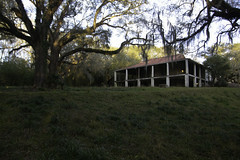 Now that the building is fifty years old, it is eligible for the National Register. 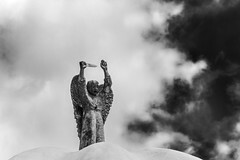 While the abandonment of Kuhn in 1989 was a terrible thing for the community and has led to the near ruin of the structure, it may have preserved details that would have been removed in remodelings needed to bring the hospital up to current standards. I am not an expert on hospital buildings in Mississippi but Kuhn could be the most intact hospital of that era extant. While not a story per se, the February 24 paper published a picture of 1402 Main St. in Vicksburg, a victim of suspected arson. While “merely” a shotgun house, this structure appeared to contain a high degree of historical integrity with wood siding, metal roof, and nicely detailed porch columns. Malvaney previously reported the redevelopment of the Trustmark Bank Building (formerly First National Bank) in the 2-26-2010 News Roundup. 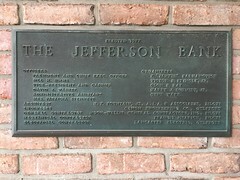 The February 19 paper illustrates one unfortunate consequence of the conversion to housing as the law firm of Wheeless, Shappley, Bailess, and Rector, original tenants to the 1905 building, will relocate to the BancorpSouth building at South and Monroe after 105 years in one location. As a little bonus information, here is an article from 2007 about the Trustmark Building. The Woodville Republican from Thursday, January 7 shows a picture of the John William Goddard House, which burned the previous weekend. Located at 940 Main Street in Woodville, the house was constructed circa 1870. While the fire was contained to the upper half story of the frame structure, it suffered heavy water and smoke damage throughout. The February 11 edition of The Woodville Republican contains a photograph and small write-up about Bethel Plantation, formerly known as Indian Fields. The new owners are replacing the lower level of columns from the two-story gallery on this house, located three miles west of Woodville, in addition to other restoration work. According to The New York Times, this house could have been yours for only $595,000 in 2003. Great job! I’m now going to look for pictures of the Goddard House in Woodville. Can’t quite place it in my memory. As for Bethel, or Indian Fields, it’s a grand house, but much has been done inside which needs undoing. I hope its new owners get it right this time. Uh oh…the Goddard House is also known as the Ferguson House and has lots of interesting woodwork inside. I sincerely hope it can be saved. Tom, I actually went by the Goddard House the week after it burned, and I’ve talked with the owner. I heard last week that the roof is back on and they’re working inside, and they didn’t put that overly large dormer on the front (which had been added). I think they may be taking the state’s preservation tax credit, so I have hopes that this will be a good renovation project. Taking a cue from W, here’s a link to the street view of the house, which really doesn’t do it justice. It has these two bay windows opening onto the front porch that are very cool. First of all, W., what a great job of zooming around the state looking into all the nooks and crannies of preservation-related news! Thanks again for taking this on, and those paper newspapers really help us see what’s happening in the smaller communities that don’t have online resources. Second, I had never thought of using the Google Maps street view as a link to show a building–in fact, maybe never realized it could be done–so thanks for showing us all that new resource! Lomax’s statements (or indeed any statements like his) will bring out my barbed wit. In the future, I will link more locations to Google Maps Street View. I ran out of time sifting through newspapers, typing, and linking articles or I would have tried to link the other house in Oxford I mentioned, as well as H. M. Nailor School. Unfortunately, Street View is not all-encompassing; there are streets in Downtown Meridian that cannot be seen through Street View. The John William Goddard/Ferguson House burned on January 2, which I neglected to put in my write-up. Some of the interior could be saved as furniture and personal belongings were removed from the house. The picture in the Woodville Republican shows that the roof did not collapse (unless it did so at the rear of the house), always a good sign when a house burns. Perhaps that means that the fire did not reach structural elements and some of the interior was spared. W. at least Oxford had a preservation commission so that the conversation is held while Starkville doesn’t care enough about its historic resources to have an hpc….maybe one day they will lose enough of their historic fabric to see that it does matter. That editorial by the Vicksburg Post about Ceres was very disappointing. I’m not saying I disagree about having a tourist attraction there–it does seem problematic–but their statement that the house “has been allowed to deteriorate to the point that renovation would cost more than new construction, and moving it, as Reul learned, is cost-prohibitive from a business perspective” is just uninvestigated hog-wash. When I was there last month, I peaked in the windows and saw no indication of any leaks or any other major problem. In fact, it looked to me like it needed some cleaning up and could be moved into without much more cost than moving into any other previously occupied space. As for moving it, I still can’t for the life of me figure out why it would cost over a million dollars as Reul’s contractor from that TLC show said–houses are moved all the time, and granted it’s not ideal for the house, but they certainly don’t cost in the million dollar range. The more I read about this story, the less is smells right.